The Inland Stakeout II is an all-American-made firearm similar to the original Ithaca Stakeout Shotgun from its bead sight. The	Stakeout II	is	BATF approved as a “Firearm”	with	a 14.5” barrel and over 26.5” overall length. The Inland Stakeout II is manufactured in a joint effort with the Ithaca Gun Company, Upper Sandusky, OH. The original steps of shotgun manufacture that was used by Ithaca has been carefully duplicated utilizing modern technology and CNC machining which yields components that are precise and accurately reproduced. 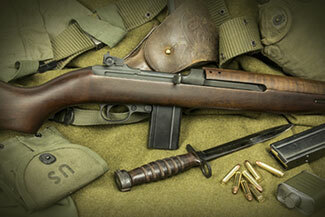 The most notable of Inland's firearm production was the .30 Caliber M1 carbine and the folding stock variant, the M1A1 Paratrooper model. Dayton, Ohio was home for the original Inland company, and is now the home of the new Inland Manufacturing located just two miles from the original facility. Today's Inland Manufacturing is now producing a new line of .30 caliber M1 carbines and 1911 style pistols.